My January goal is to experiment with as many whole grains as possible. Why? Well, they are a great source of fiber, B vitamins, and minerals. Also, I have been accumulating fun ones for quite some time and my cupboard is OVERFLOWING! I am breastfeeding my wee one and craving carbohydrates like crazy. Whole grains are a great choice to settle those cravings because they will help keep me fuller longer than less fibrous options. My dear friend Kara is a Minnesotan. She turned me onto this breakfast idea- its a good one doncha know! 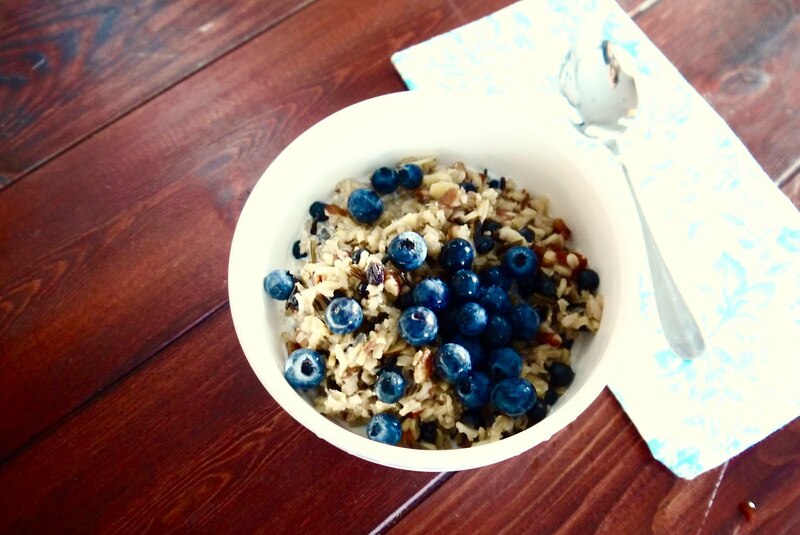 Combine rice, pecans, almonds, dried blueberries, maple syrup, and 1/2 cup almond milk in a large pot. Heat over medium-high heat until milk is absorbed and mixture is hot. Serve in four bowls, pouring remaining almond milk over the top and sprinkling with blueberries prior to serving.